View of Hart Street in Henley. 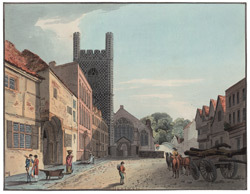 In the 18th century, the town was a convenient stopping place for coaches on the way to London. Many of the town's 16th or 17th-century buildings were refaced in the Georgian period. Other town industries included malt, meal and timber, which were loaded here for transport to London.